This was bound to happen someday. After all our ridiculous telecommunicating platforms, remote drones, and general toying with robots as play things--robots can control us now. This new chapter for human-robot interaction came from an experiment ran by a group of French researchers of the Montpellier Laboratory of Informatics, Robotics, and Microelectronics (LIRMM). 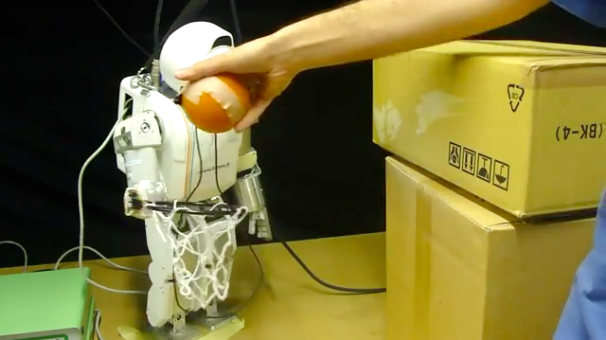 In the experiment, a Fujitsu’s HOAP-3 humanoid robot controlled a person’s arm using electrodes to drop a ball into the robot’s hoop. To do this, the researchers broke down the physiology of a person’s arm into mechanical parts: a bending elbow, a twisting wrist, and a gripping hand. Electrodes were placed on the person’s arm so the robot could manipulate their muscles using a technique known as functional electrical stimulation (FES). The patients were also blindfolded to keep them from moving the arm on their own--or possibly freaking out like I would. The experimental trials were successful, but the researchers still call their results only “good enough”. The research is still in an early proof-of-concept phase, as the robot also has to move its hoop after the patient’s arm has been manipulated into the “cooperation zone”. Another issue is that the scientists can only make a patient’s elbow move in one direction and in a plane, and their arm must sit on a surface. You can find the PDF of paper, as provided by researcher Bruno Adorno, on the LIRMM website. The goal of the research is to create a robot that can help rehabilitate and retrain motor control for patients suffering from paralysis and other disabilities. In the future, the scientists hope to create better results by improving their electrical stimulation system, so they can create more precise movements in more directions.